I am the first to admit, I am not a baker. I don’t bake homemade bread, or cinnamon rolls, or cake. And Lord knows, I wouldn’t even think about trying to make a pie other than a chocolate one with three ingredients and a store-bought graham cracker crust. While I’m a pretty decent cook, I am admittedly a terrible baker, most likely because I never follow a recipe. So I just don’t bake. And honestly, I don’t need to. Whenever we have guests for dinner or a special holiday celebration at our house, I simply go to the freezer, take out a pie from The Village Pie Maker, bake it for a little more than an hour, and voila — our guests savor bite after bite of the best fruit pie they’ve ever tasted and I can say (without lying) that I baked it myself. A frozen Village Pie Maker Pie. No canned stuff in this masterpiece. 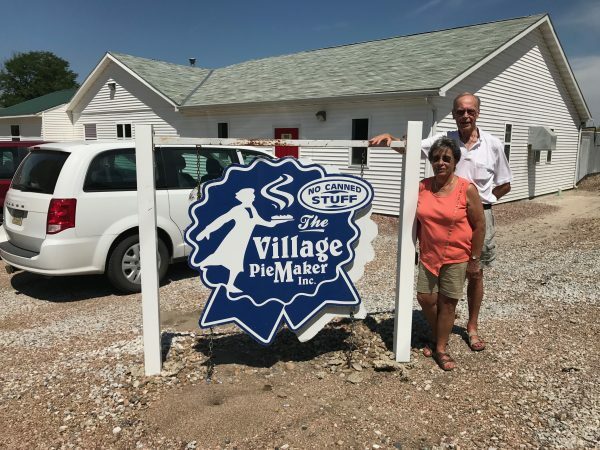 We’ve enjoyed The Village Pie Maker pies for years and I’ve always been curious about the company, headquartered about 170 miles west of here in the small, rural village of Eustis, Nebraska. So, when we headed out on a week-long vacation across Nebraska this summer with Steve’s mom and dad, I looked into touring The Village Pie Maker operation and sadly, found that they don’t give tours. Steve’s parents John and Gayle Teget outside The Village Pie Maker shop in Eustis, Nebraska. I spoke with one of the businesses partners, Rob Hartman, who told me they get several calls each week asking about visits, but because they are a small operation and are not set up for spectators, they cannot accommodate tours. However, since we were inquisitive travel writers, he was willing to meet us at the shop, answer some questions, and give us a brief sneak peek at how these delicious pies are made. The original Village Pie Maker is a woman named Judith Larsen, who began selling her homemade pies in 2002. Her company’s website says it was her grandmother who taught her to make pies. 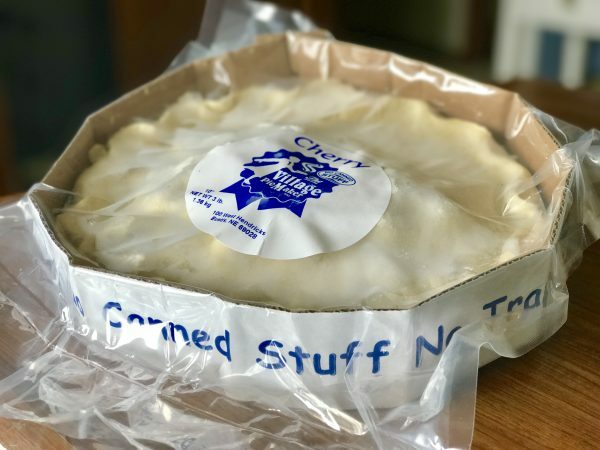 Hartman said Larsen was selling pies at a local Farmer’s Market. 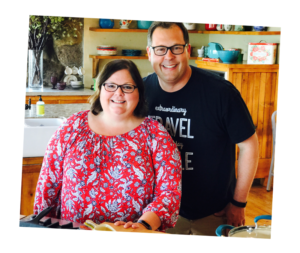 To keep up with demand, she converted her grown son’s bedroom into an extra cooking space and little by little, the popularity of her pies grew. Larsen now lives in Arkansas, but was recently back in central Nebraska and was the keynote speaker for the Sumner School’s first career fair. That’s right! About 25 workers gather weekdays to assemble pies in a super clean and organized kitchen. 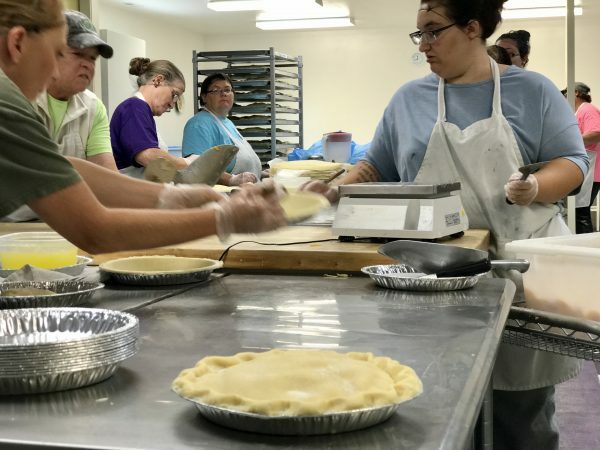 Last year, they made more than 460,000 pies and can produce up to 12,500 in a week during the busy seasons. Of course, fall is when most pies are made and sold, as they make the perfect dessert for special holiday celebrations like Thanksgiving and Christmas. Workers at the Village Pie Maker fit the crusts to the pans by hand. Now made, these pies freeze before being packaged and shipped. Dough starts being made at 4:30 a.m.
For more than 11 years, Cynthia Wolf has been one of the first at the shop each day, arriving at 4:30 a.m. to begin mixing the dough for the 10″ pie crusts. Hartman could not say enough good things about the production manager, her strong work ethic, her management and organization skills. And, her innate ability to know just how much flour to add to the mix. “She says she does it by feel,” Hartman said. And her method works. Is that an amazing pie crust or what? This mixer helps with the delicious magic at the Village Pie Maker. 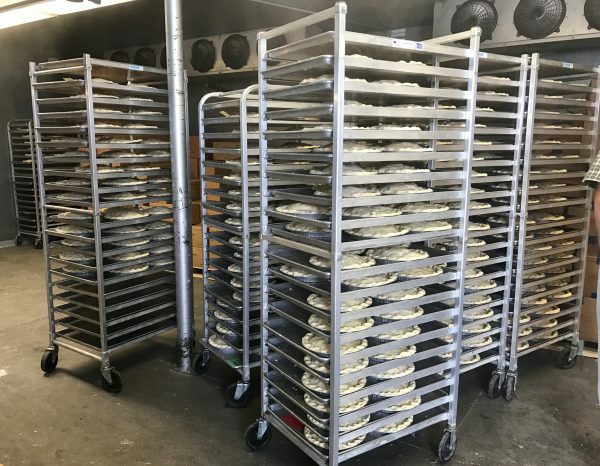 By 6 a.m. when most of the other workers arrive, the dough is ready to be measured out by hand and pressed into foil pie plates and the pies are ready to be assembled. 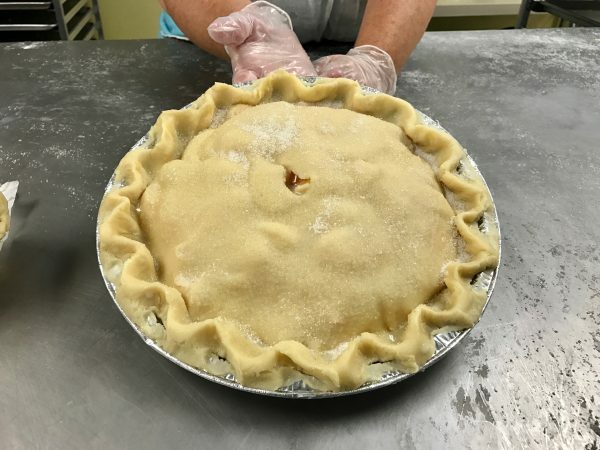 From making the dough fresh each morning, to putting the fruit filling in the pan, to crimping the crust and packaging the pie, almost all of the work is done by hand. 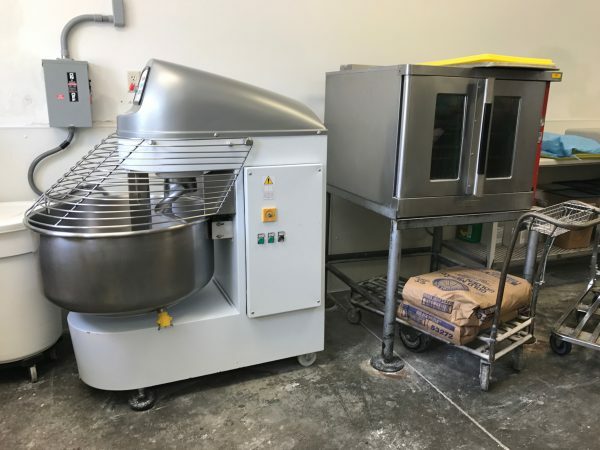 Yes, they use giant mixers to prepare the dough and even the fruit, but a real person is operating those machines and real people move the huge containers of fruit, weigh the filling, measure the dough and assemble the pies. A worker displays a pie right before the top crust goes on. Workers in the kitchen told us they rotate stations throughout the day so they aren’t doing repetitive motions for hours on end. 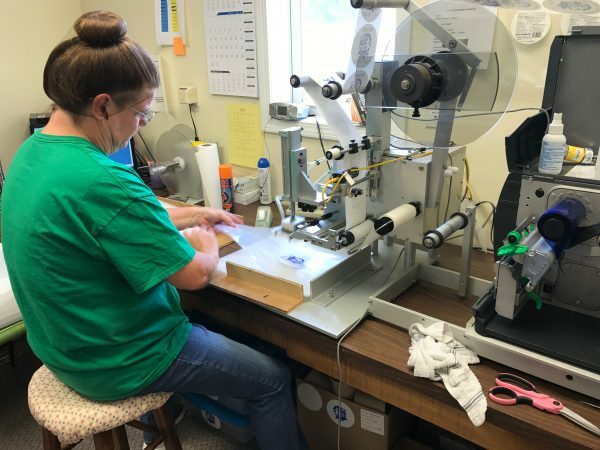 They said they switch jobs about every 20 pies, taking turns weighing and measuring, filling the crusts, crimping, and shaking sugar on a each one before it is packaged. Don’t believe me? Just watch this video. A-MA-ZING! Hartman said the fresh fruit comes to Eustis frozen and it stays that way until you put the pie in your oven to bake. He said they buy the fresh fruit frozen and work hard to make sure it comes out of the freezer, goes into the pie, and back the freezer without completely thawing. 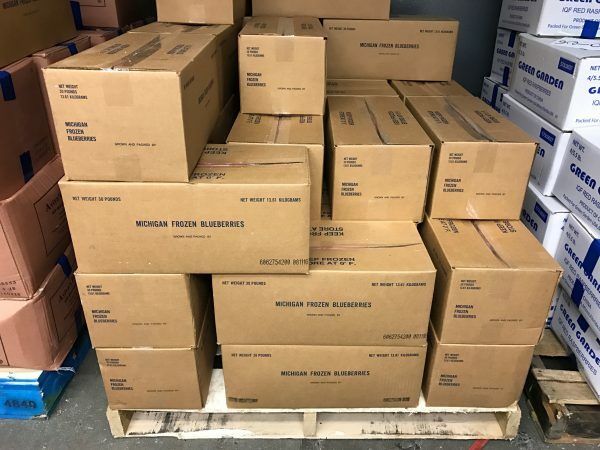 Boxes of fresh-frozen fruit wait to be turned into delicious pie filling. He said they have certain fruit growers they love and will reject shipments that don’t meet their high standards. He said once he tried ordering blueberries from a grower that offered the sweet berries at lower cost. They tested the less expensive berry when it arrived. It didn’t live up to their high standards so wasn’t used for the pies. “I learned,” he said. About 200 pounds of it every day. No wonder the crust is so flaky and delicious. 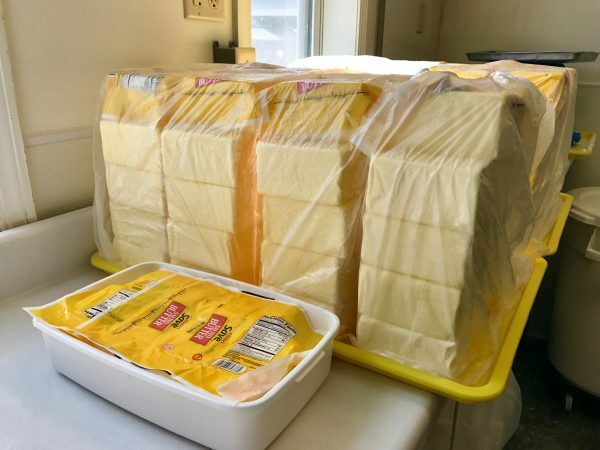 A stack of real butter waits to be used. No surprise to us, cherry is the most popular flavor, according to Hartman, followed by apple and peach. 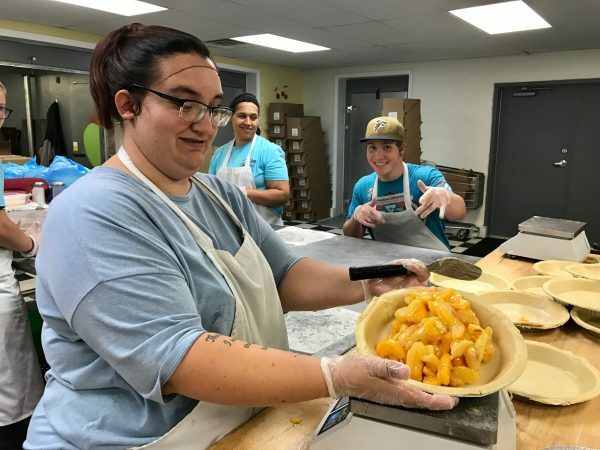 While The Village Pie Maker makes at least 10 varieties of fruit pies, cherry, apple, peach, strawberry-rhubarb, berry medley, and blueberry make up 90% of their sales. Cherry has always been my favorite. It is made with bright red, tart cherries with just the right amount of sugar to add sweetness. Unlike some other cherry pies I’ve had, this one is chock-full of cherries so you don’t have to go searching for bits of fruit buried in some sort of processed filling. A freshly baked Village Pie Maker pie. Apple is the second most popular flavor. It is made with crisp Granny-Smith apples with just the right spice seasoning to make it perfect for a fall meal or a summer picnic. The apples are sliced a bit chunky, so you taste them in every bite. Other pies include blackberry, cran apple nut, raspberry-peach, and rhubarb. Village Pie Maker pies are sold all over Nebraska where we live (thank you, Jesus) as well as 16 other states. Most of them are in the Midwest but they are also sold as far away as Kentucky and New Mexico. Grocery retailers Hy-Vee and Fareway carry them in some Nebraska and Iowa locations. To find the retail outlet nearest to you where Village Pie Maker pies are sold, CLICK HERE. A worker affixes labels to pie packaging at the Village Pie Maker. 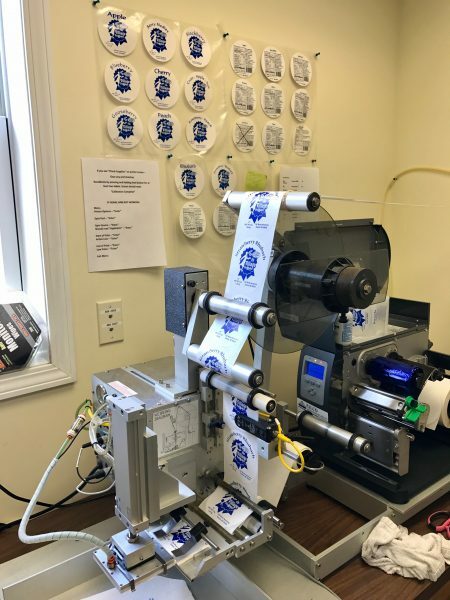 The machine that affixes labels to the packaging for the pies. We were so impressed with everyone we met at The Village Pie Maker. From the woman who was putting labels on packaging, to those filling pie crusts, and managing the kitchen, everyone was so nice. It was obvious to us that they work hard, help each other out, take pride in what they do and … yes, they have fun. Loved this shirt one of the workers was wearing. Before we left, I just had to ask Hartman the secret to making the best pie ever. “Have a good recipe and follow it,” he said. As for me, I’ll just take one out of the freezer. Enjoying a Village Pie Maker cherry pie with family. Have you tried The Village Pie Maker pies? Which is your favorite? We have a Village Man Pie Fundraiser for our AfterGrad Party before Thanksgiving, Christmas, and Easter, in our small town, in SE MT, of 400 people…You know they are Awesome, with an order of 200- 300 each time!! We also drive 200 miles roundtrip, to pick them up in Belle Fourche, SD! .Worth every MILE!! Thank you for a slice of Heaven, at our tables, and a Great Fundraiser for our AfterGrad Party!! Everyone wins around here!! <3 and YES< the Black Cherry Pie was my ALL time Favorite! 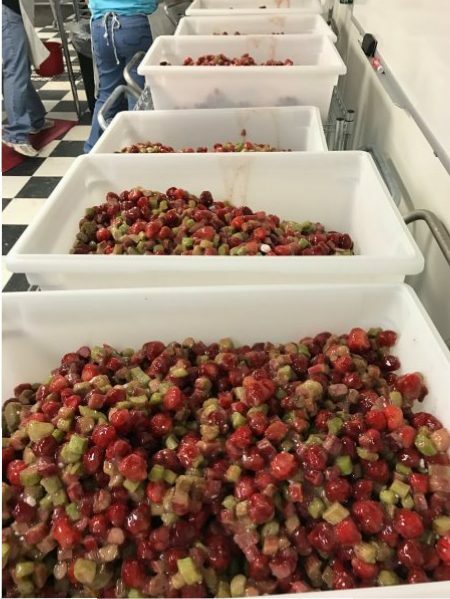 😉 Our high seller is Strawberry Rhubarb, we usually have 3 times as many of S/R than any other pie, then Cherry, Apple, Peach, and so forth…it's been fun! Excellent pies for a worthy cause!!! Love your pies! How can I have one sent to Indiana? Do you package any for shipment? Your pies are the absolute best I have ever had, love how personal each one is prepared. I am from Arizona and visited in Iowa. Tasted the pies and want to find a way to get them here. They are wonderful. Yes, it would be great if they shipped the pies! I’m from Omaha and our Hy-Vee supermarkets sell your pies. I love the crust. My mother, too, but sugar on top. My favorite pie is cherry with peach coming in second. I would like to give you my mother’s rhubarb pie recipe if you’d be interested. It’s absolutely delicious and very different from the norm. My husband loves rhubarb pie. I would love to have your recipe. Sorry, but we don’t have the recipe. We love just being able to buy one frozen and bake it ourselves. We’ll have to try the rhubarb. I love your pies. A few years ago I loved the gooseberry but have been told they no longer make it. I would love to know IF it ever comes back. We’re glad you liked our story about the pies. We aren’t the Village Pie Maker, so we don’t make the pies, but agree they are wonderful. Contact the company directly with any questions about pie flavors. Strawberry rhubarb is definitely our favorite!!! These pies are wonderful. I have found them at Price Chopper in KC, KS, and even a small grocery store in Kingman, KS. I live 35 miles away and we make a special trip to buy pies. My personal favorite is peach, but I haven’t had one that wasn’t good. The crust is to die for. They aren’t cheap, but you get what you pay for, A GREAT PIE!! 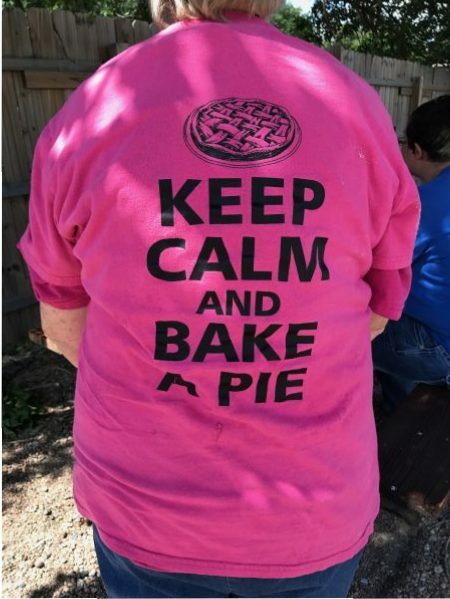 They are great pies, indeed, Karen! We’re partial to cherry, but after hearing so many positives about the peach pies, we may have to give those a try. I’m a pie maker too, tried yours and they are wonderful, but a lot of your now!! Their pies are awesome. I’m not a baker but they are great on a smoker. Hello from a fellow Nebraskan! I was happened upon your blog post when telling my husband about this pie company in Eustis. What a great article and they have great pies! What a terrific article, Ann & Steve! So nice to find you guys again! Now we know why we couldn’t find the black cherry pies we were searching for last Christmas. Happy journeys, you two! Steve, Do you have contact info for Judith? If so, you can private message it to me. I would really appreciate it, I haven’t seen her for several years and would like to say Hi…. Thanks! I’m sorry but we do not have her contact information. I hope you get in touch. Clark (aka: Superman)- I have sent you a private message on Facebook about it. I met and worked with Judith before she started the Pie Maker business. She has done so well…hard work, determination and faith can help achieve so much. I wish we could have kept her in Sumner! I knew Judith when….. She put in long, long hours in the beginning. I have great respect for her. Hope she reads this! ❤️❤️❤️their pies!!! Used to live in Lincoln and could get them any day but moved to CO and thankfully found from their list I could get them in a tiny town, in a small privately owned store about 10 miles south of me!!! So I went and got my favorite…blueberry!!! That’s great! 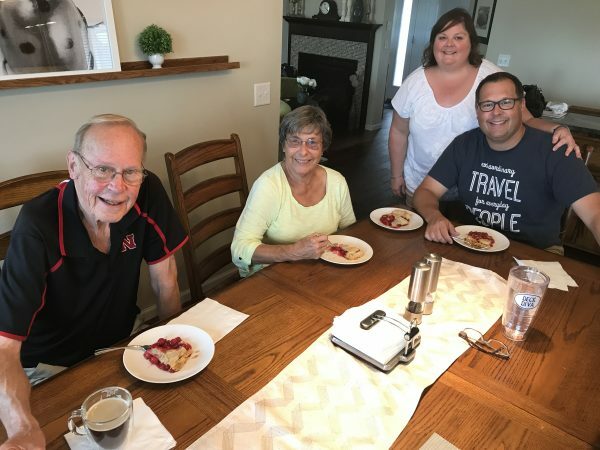 Glad to hear you were able to “reconnect” with their blueberry pie! They are no longer making the black cherry pies. That’s too bad. Many of our followers will be sad to hear that. In any case, there are lots of other great choices. That was by far our favorite, but there’s still other good choices also. Three or four years ago they made a Black Cherry Pie that was my absolute favorite, but apparently they stopped making it. PLEASE bring it back! 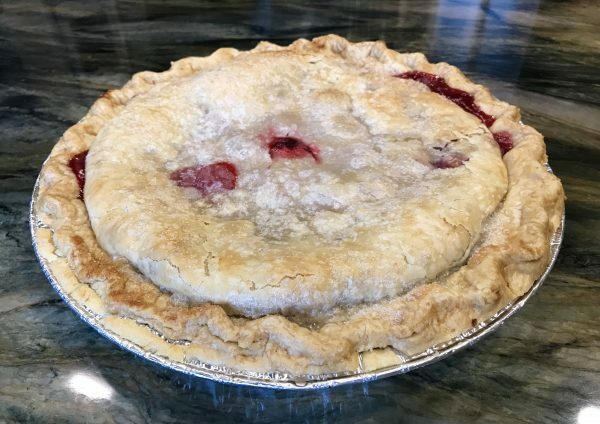 We’ve heard from several people who have enjoyed the black cherry pies. We’ll have to give them a call and see if they are still making them. Ooooooh! These sound delish, and it looks like I can buy them here in KC. Thanks for the tasty tip! You will love these pies, Sage. They are absolutely delicious! I’m going out to get some! Thanks for the tip! You’re welcome, Tim. The pies are available at Foodmart here in Crete!